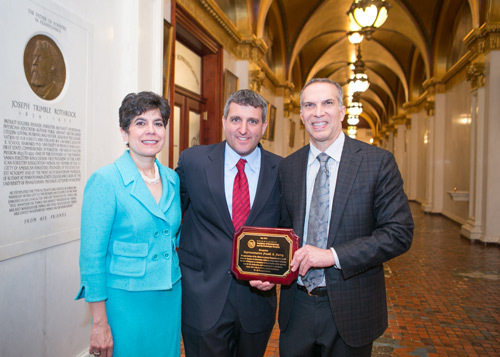 Rep. Frank Farry (R-Bucks) was recently honored by Pennsylvania Academy of Dermatology and Dermatologic Surgery (PAD) for his efforts to protect Pennsylvania’s youth from the dangers of ultraviolet radiation from indoor tanning and his willingness to champion critical health safety matters. Farry was the prime sponsor of legislation, which was recently signed into law, preventing teens age 16 years of age and younger from indoor tanning facilities. Pictured with Farry are PAD member Christen Mowad, M.D, and PAD Legislative Chair Bruce A. Brod, M.D.